Hardwood is one of the best flooring choices known throughout the world. In fact, a beautiful, well-maintained hardwood floor is perhaps the only type of flooring that can add value to a property. The combination of beauty, class and warmth/homeliness in hardwood floors is unquestioned, yet it is never the most popular type of flooring in any country. Even though in one country carpet is the most popular and in another, tiles, people still have the highest regard for hardwood floor. It’s just that they also think hardwood floors are difficult to maintain. However, the maintenance of a hardwood floor is as straightforward as caring for the exterior finish of a car. All you need to do is apply a layer of wax or polish to protect the finish and maintain the shine. It’s the same with a hardwood floor, and since hardwood floor polish is a lot less messy than wax, we decided to concentrate on the best hardwood floor polish reviews. 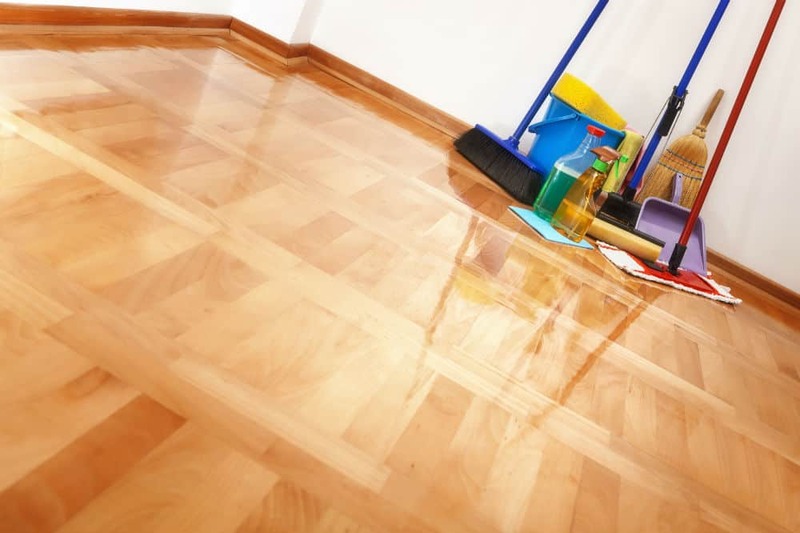 Hardwood floor polish leaves a protective layer and shiny finish on a hardwood floor. You don’t have to remove the old polish because a new application of the same or compatible polish will fill in the gaps in the old polish and add another layer. You only have to vacuum and mop the hardwood floor and wait for it to dry before applying the polish. Bona is a Swedish company that’s been making wood and laminate floor products since 1919. No best hardwood floor polish reviews would be complete without Bona. There are two versions, high gloss and low gloss, and we’ll talk about the Bona High Gloss since most people prefer their hardwood floor on the glossy side. Both Bona High Gloss and Low Gloss are urethane acrylic blends. The Bona High Gloss dries very quickly without any waxy build-up. It works with both unfinished hardwood floors and those that are prefinished with polyurethane at the store or factory. Make sure that your hardwood floor can take this polish by applying the Bona High Gloss to a small area first, especially if your floor is oiled or waxed. We found the Bona High Gloss incredibly effective. It polishes the floor and fills in small scratches at the same time. Hard to remove after application, but this is a problem only if you try to switch to a polish with natural ingredients in the future. Orange Glo is among the who’s who of the best hardwood floor polish reviews. This hardwood floor polish is extremely popular for its orange scent and super glossy shine. Orange Glo is a wax emulsion infused with oil from orange peels, which explains its scent and extra glossy shine. It will work with all hardwood floors though we had the best results with sealed floors. Orange Glo seems to last much longer on polyurethane sealed floor, while on other hardwood floors, this polish can become dirty after a week or so. This floor polish is marketed as a hardwood floor 4-in-1 monthly polish: 4-in-1 as in it cleans, shines, protects, and revitalizes. Cleaning is the only extra function that Orange Glo delivers compared to other hardwood floor polishes (since they all shine, protect, and revitalize). The polish doesn’t last more than a week or so if used on unsealed floor. There are reports of waxy buildup after repeated use. Holloway House’s Quick Shine is billed as “High Traffic Hardwood Floor Luster.” It is a hardwood floor polish made from plant-based carnauba wax and petroleum distillate. This is another staple in various best hardwood floor polish reviews. Quick Shine works with all hardwood floors, new factory-prefinished hardwood floors, and older, sealed hardwood floors. The polish works best on older hardwood floors that have lost their former luster. However, the difference after using this polish is spectacular on all floors, not just on older and dull floors. This hardwood floor polish is very easy to apply. Just squirt it on and spread. Before you go through the trouble of sanding, staining and resealing your old hardwood floor, give Quick Shine a try and chances are you’ll be thrilled with the results. 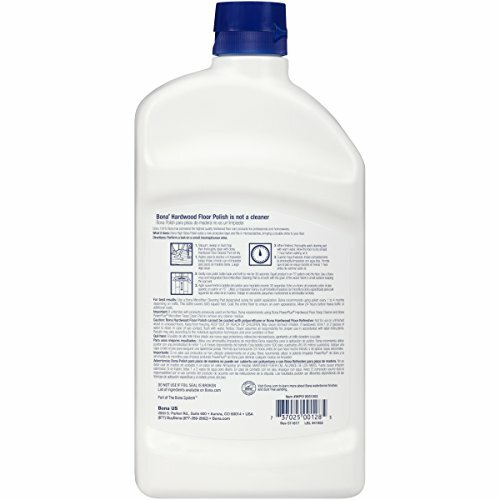 We found Quick Shine to easily last more than a month on high-traffic floors. While all manufacturers claim that their hardwood floor polish can last a few months, this is definitely not the case. The other advantage of this polish is that it’s highly buff-able. Apply and buff for an extra glossy finish. Orange Glo and Quick Shine are wax and petroleum distillate-based polishes that must be used with sealed hardwood floors. We found Orange Glo to offer an artificially high gloss, which together with its orange scent may appeal to certain individuals. In most cases however, you will get a much longer lasting shine from Quick Shine. As we bring these best hardwood floor polish reviews to a close, we have to admit that we were sold by the Bona High Gloss hardwood floor finish. This is a urethane acrylic polish that works with all types of hardwood floors. Bona High Gloss is by far the fastest drying hardwood floor polish. The shine is natural and long lasting. You may at first find the shine understated compared to other polishes of splashier results, but you’re guaranteed to love the natural, long-term results. Once you’ve tried Bona High Gloss, you may never want to use another hardwood floor polish again. 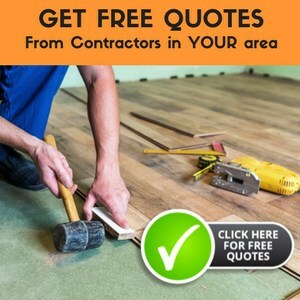 What’s best for use on Par-ky real wood laminant flooring?